When I was younger, my cousins and I used to play memory games using a standard 52-card playing deck. We had to arrange the cards manually on the table and clean up afterwards, but we had a lot of fun playing. Nowadays, though, you don't need cards to play memory games anymore. My sons, for example, now use various iPad games to sharpen their short-term memories. One of our newfound gem is Memollow, a cute little game that offers a fun and rewarding playing experience. Memollow is a cute memory game for juniors. Memollow is a unique memory game where you flip over squishy pillows (instead of typical playing cards) to find matching pairs of illustrations. It is of note that the developers creatively made and photographed their own pillows, and then embedded hand-drawn cute illustrations on one side of the covers. To play the game, you choose from 10 different themes. Selecting any one of them direct you to a set of 20 pillows with covers that depict the selected theme. For example, the animals theme pillows are embellished with cute illustrations of cats, dogs, ladybugs, rabbits, and other animals. You flip the pillows two at a time, and try to complete all the pairs. Once you have collected all 10 pairs, the app shows you a short animation video that features the pillows and the cover illustrations. For example, the cars theme video shows two different cars successfully performing jump stunts, and a third car failing gracefully to fall on top of a pillow placed in between the track gap. Following through the developers' vision to bring happiness and joy through the games they designed, Memollow embraces a free-play format with no timer and no scoring system. This creates a fun and comforting environment to play in. The game also has a subtle hint system to help juniors who are having difficulties finding correct pairs. After 10 consecutive failed trials, you will see two bouncing pillows to suggest where you can find a matching pair. You can follow the game's hints, or continue to find a matching pair on your own. When you succeed, the game will suppress the hint. This allows juniors as young as one year old to play the game with minimum guidance from their parents. I personally had a lot of fun playing with my one-year-old, Noah. The encouraging narrator really helps keep juniors motivated, and reflects the positive energy of the developers. In this following video, you can see that the developers had a lot of fun designing the game too. Memollow has beautiful illustrations and subtle animations throughout the game. Even when you're not interacting with the app, there are many elements to keep you entertained. For example, you can see a cute animation playing subtly around the Memollow logo even when you are idle. The background music also creates a soothing feeling as you play. Another thing I really like is the selection of themes. The developers picked a wide variety of themes that juniors are familiar with, like letters, numbers, animals, dinosaurs, cars, vegetables, and ponies. As father to two boys, this is the first time I have seen ponies in a kids' app, and I must admit that they look adorable! Squish the pillows to find a matching pair. 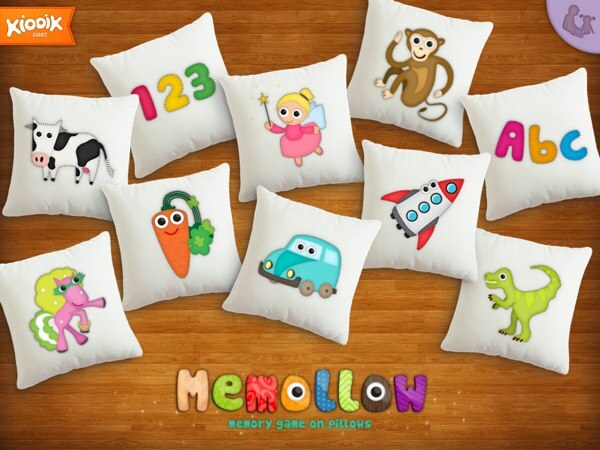 Memollow is the cutest and squishiest memory game that you can find on the App Store for juniors ages one to four. With more than 100 beautiful pillow illustrations, the app would keep juniors coming back to play the game. Also, if your juniors want to interact more with the cute illustrations, you may want to check out another app from the same developer, entitled Memollow Coloring Pages. This newly released app features all the cute drawings in Memollow for juniors to color in. Preschool EduKids Room. Activity app trains various skills with 16 fun mini games. Herd Absurd!. Mix and match colorful parts to make your own funky animal hybrids. Timmy Tickle. Activity app lets kids play music, color, and rollerskate with Timmy the octopus.